This tour will show you what Ghent has to offer and you will get to know 3 original restaurants. Every restaurant serves one part of the menu, from starter to dessert with the possibility to taste special beers. Walking from one restaurant to anoter, the guide will not only tell you some interesting facts and historical anecdotes about the city but also something more about the beers. 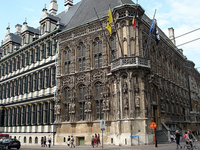 At 18:00 hrs you are all welcome at the Town Hall of Ghent (map), located at the Botermarkt 1, for the Welcome Reception. From 19:00 hrs to 20/00 hrs we would also like to invite you to the Salsa Course which is organised by Dr. Ruth Van der Looven. At 19:00 we welcome you for a 3 course dinner and dancing in the St. Peter’s Abbey, one of the finest monuments in the city of Ghent (map)! Everyone who is planning to stay the weekend in Ghent, can visit the exhibition "80 days of summer" at a reduced rate. During 80 Days of Summer - Roots & Roads, you follow in the footsteps of many as you wander from one history to another. The dialogue between non-everyday photo exhibitions and the very special historic buildings of Historische Huizen Gent, makes this second edition of the Ghent photo festival a miraculous journey around the world in 80 days. For more information, you can visit the website. Please contact sophie@medicongress.com to book you tickets.